Was not going to publish a post today as I was annoyed at myself for spilling my 2nd batch of successfully sprouted adzuki bean before I took photos. No sprouts no new recipe. After I calmed down, realized there is a lesson to be learned here. Decided to work with the photos I had and reblog photos and recipes from previous posts. As I had suspected, reason for the failure in the first batch was because the beans were too “old”. 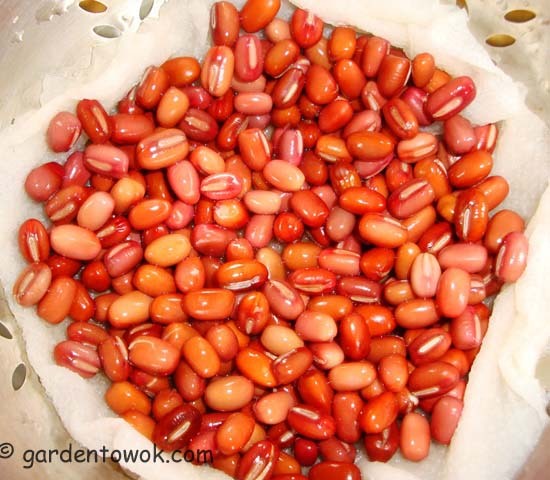 Most were not viable and would not germinate (still good for soup and other bean dishes but not for sprouting). The newly purchased adzuki beans sprouted without any issues. Adzuki beans after overnight soaking. The adzuki beans in the above photo were the beans I had in the pantry for a while, may be 2 years or more, after overnight soaking I did notice that more than half of the beans did not plump up but did not think anything of it. The beans that plumped up sprouted but the un-plumped (is there such a word?) beans did not. The adzuki beans in the above photo were the newly purchased beans. Notice how all the beans are plumped and ready to germinate. Yes, all the beans sprouted. The 3 photos below (previously published on 1/22/13, click on link for the complete post) show the different stages of the sprouts. This is what the sprouts look like after 24 hours. The tiny roots are just appearing. This is what the sprouts look like after 48 hours (on the second day) The roots are about ¼ inch long. This is the stage I prefer. NOTE: Sprouts will sprout quicker if you live in warmer climate or is sprouting during warmer weather. If it is hot and humid, you may need to rinse your sprouts 3 times a day instead of 2. Since I sprout during the winter, I rinse twice daily, in the morning and in the evening. 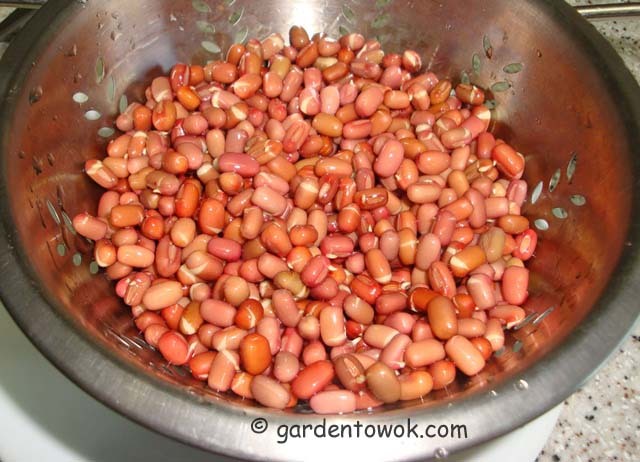 When soaking beans for sprouting, if many of the beans did not plump up after the required soaking period, forget about sprouting, make soup or other bean dishes with the soaked beans instead. Below are photos of 2 dishes I created using adzuki beans sprouts. I do need to get into my shed to retrieve my seed starting supplies. Hoping there would not be any more significant snow fall decided, on Wednesday, to clear away the snow from the front of my shed door. Guess what? Woke up to more than 3 inches of additional snow fall yesterday (Sunday) morning, I was not a happy trooper. 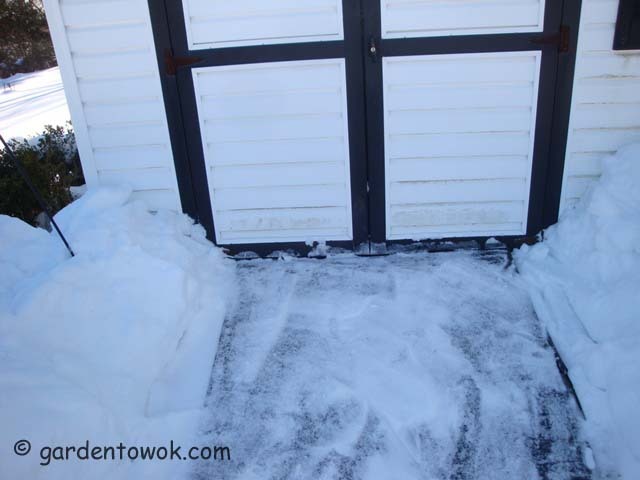 Even though I cleared away the snow I could not open the shed door. The ramp had shifted a bit preventing the door from opening, a big disappointment. Will have to wait until the ground thaw to reposition the ramp. Hoping for warm weather. Still without my seed starting supplies so off to the garden center to buy what I needed. Found cell packs and trays but no pro-mix. I need my pro-mix! Hope the supply arrives at the garden center soon. 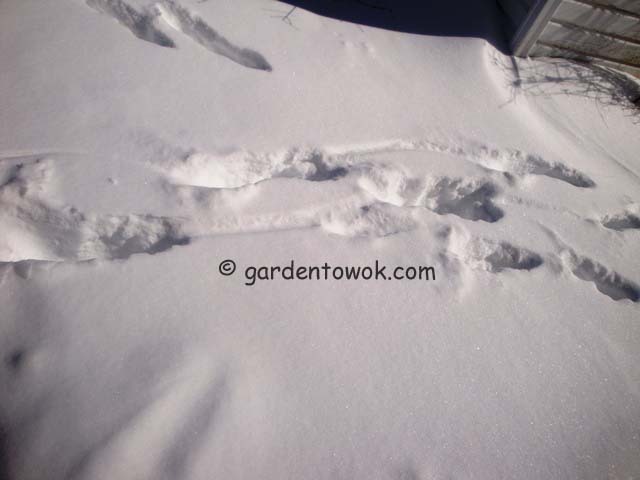 The deep snow did not keep the deer away, in the photo below are some foot prints they left in the snow between my back door and the shed. First day of spring is only 25 days away! 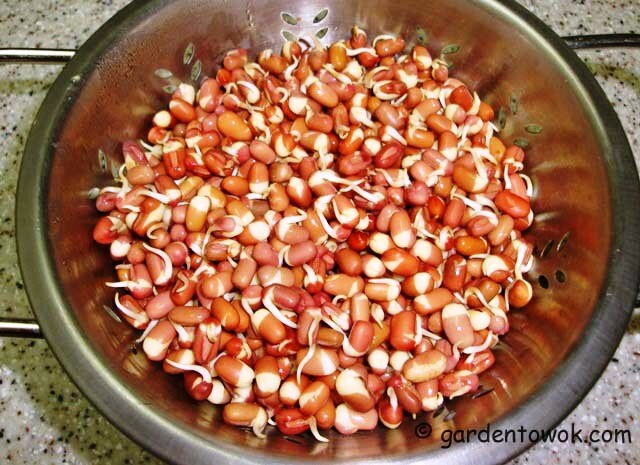 Image | This entry was posted in Growing sprouts, Harvest Monday, Uncategorized and tagged adzuki bean sprouts, adzuki bean sprouts stew, adzuki beans, adzuki beans sprouts salad. Bookmark the permalink. 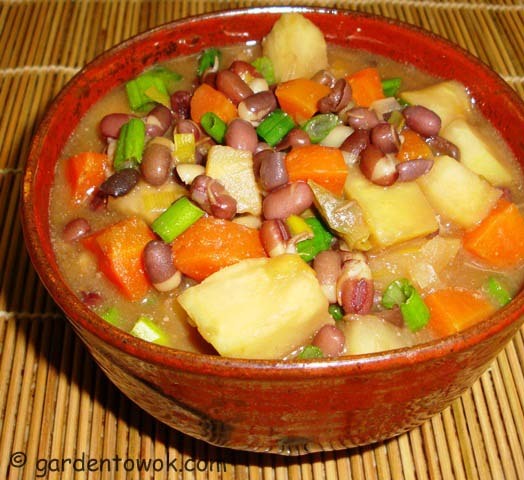 Your sprouted adzuki bean dishes look delicious, very inspiring! Hope you thaw out soon, how frustrating to do all that digging and not be able to get into your shed. I sure hope we thaw out soon. I can commiserate with you on getting garden supplies. I dug out the entrance to the greenhouse last week, and when I went to get some of the seed starting mix it was frozen solid – inside the greenhouse! I had to bring it inside the house to thaw before I could use it. I am ready for spring too! I really need to experiment more with sprouted beans. 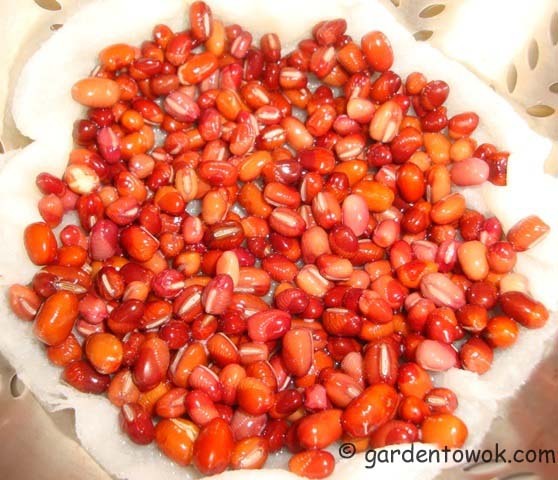 The Adzuki bean would be a good candidate for one of my spotlights, and I like your ideas for using them after sprouting. Do you use them in recipes without being sprouted first? Yes, I do use the adzuki beans, without being sprouted, just like any other dried beans. They make great tasting soup and also in rice and beans. we used to made salad with peanut dressing with it, damn delicious!!! When I am too lazy to make sesame seeds paste I will use peanut butter as a substitute. That sprouted red bean salad looks fantastic. Wow! It sure doesn’t take long to sprout the sprouts! You really have to bundle up with a shovel in hand to get to your supplies! I am hoping we thaw out soon. Hope the snow thaw out soon, the vegetable stew looks good and delicious. I hope so, expecting low of -11 tonight. Ah nature is a funny thing – blocking access to your shed, then providing deer footprints as a consolation prize! Hope you can get to your tools soon; I can’t imagine the frustration! Your bean sprout salad looks colorful and fantastic. I will eventually be able to get to my garden tools and supplies, just a matter of time. Thanks. Yes, spring is only 25 days away, you and I will be playing in the dirt real soon. I totally feel your pain with the snow. Now with seed starting supplies because I keep them in a second bedroom, but oh the snow has been a pain. We had some snow come off the solar panels in a big way and it warped my fence. We had to shovel it out to get it put back together right. And with the warm weather we had on Sunday (which lasted all of one day) now everything is frozen solid. Before at least it was snow on the sidewalks. Now they are skating rinks. I think Sunday’s warm weather did harm instead of good because of the overnight low temperature froze the melting snow before it had a chance to flow off, expecting -11 tonight. I still haven’t intentionally tried sprouting beans. I’ve had some old ones that didn’t plump, and while I did make soup with them, some of them didn’t get tender, either. Now I try to pick out the “dead” ones after soaking if my beans are fresher. 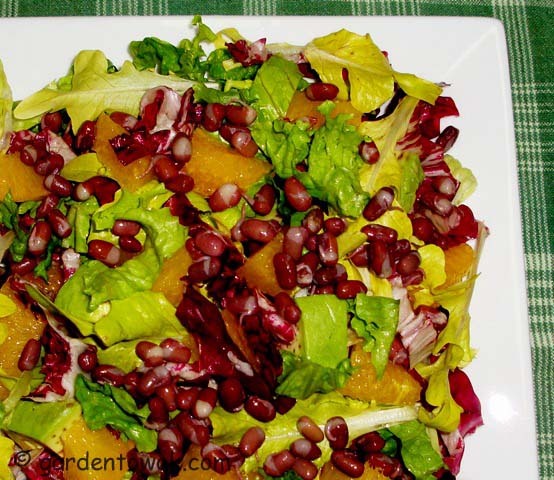 Your salad looks like a very delicious and texturally appealing combo with the beans, orange and sesame flavor! 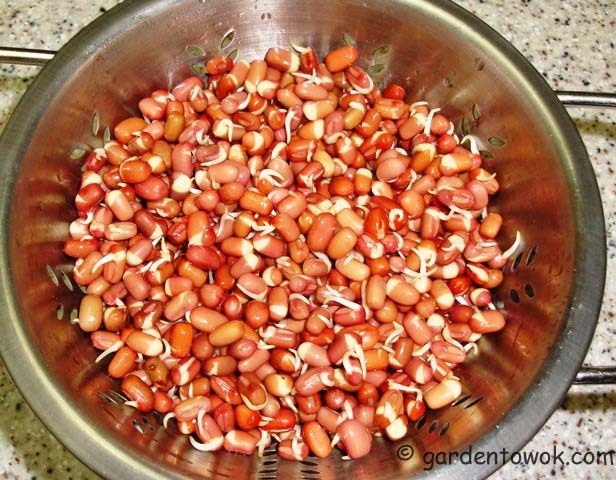 I plan to sprout another batch of adzuki beans and may try to sprout other beans as well. I understand the nutritional value of sprouts is huge, but since I do not know enough decide not to mention it in my post. Thanks for stopping by and taking the time to leave a comment. The snow scenes are beautiful and tranquil, unfortunately we are having too much of this beauty. I didn’t know that old beans don’t sprout, I had it happen more than once. At any rate I did make soup from them so nothing was lost. That root veggie stew looks great, celery root is one of my favourite veggies (although the one’s we’ve had available have not been great this year). We are expecting another 5cm (~2 inches) of snow tonight, I know it’s not much but it’s enough if you already have a few feet of snow. We have officially run out of space to put the snow. And it’s been brutally cold, polar vortex temperatures. 25 days seems like an eternity. I should have know better but was not thinking when I tried to sprout the first batch. Old beans like old seeds germination rate is poor. Any additional snow on top of what has accumulated is not good I am hoping we do not get anymore, brutally cold where I am too. I just can’t wait for the first day of spring :). And I so love how your beans came out looking. You are, to me, a genius at gardening. First day of spring will be here before we know it. I am still learning a great deal about gardening from others, that’s what make gardening so much fun, always learning. Thanks, glad you learned from my post. The snow bank by my driveway is even higher now and with the brutally cold temperatures will be a while before it all melt away. We did not get as much as the city Boston, it over 100 inches (over 2.54 meters) of snow. Yes, spring will be here soon. It’s been a long time since I’ve seen frozen ground. Those sprouted adzuki beans in the salad look SO good. I wanted to reach in with my fork. Don’t you miss the beautiful snow scenes? If the dried beans are current season crop they will sprout any time of the year.